Now I am working over feature requests. Recently the FBX import was done. It is important because it saves properly the smoothing groups. 3D-Max <9.0 and Maya are not able to export correct OBJ files with smoothing groups, so FBX import is important for MAX & Maya users. 3DMax 9 is able to export/import correct OBJ files, but not everyone have Max 9.0. 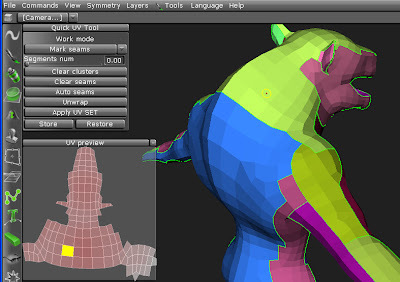 The other important feature - ability to export low-poly meshes with original positions of vertices. It is mostly important for users that use Auto-mapping. The pallette window is now resizable and can be closed if necessary. The new important feature - presets window. You can store there full state of pen shape / radius / depth / strip shape / material / filler / color / smooth and restore that settings any time by one click. It can speed up work much. The new navigation bar is implemented, it can be useful for those peoples who use pen. The old annoying bug is fixed - undo in line mode was sometimes incorrect. Some peoples had a problem with input dialog - it also was fixed. The update is coming soon! Please vote in right panel. 2.02 is done! You can read about list of changes on site http://www.3d-brush.com/. I want to tell there mostly about two new features - topologocal symmetry and quick uv - mapper. The next milestones - I want to implement FBX support, texture baking, space mouse support (if I will be able to buy it) May be someone can send to me that mouse? It is so difficult to get it in Ukraine! I have made new tool - topological symmetry. 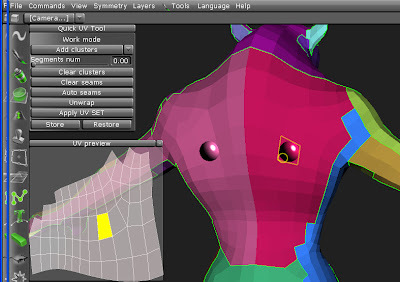 Sometimes models have no geometrical symmetry, but polygons structure is symmetrical. If it is so you can flip some layer or duplicate layer with symmetry flipping. To define the topological symmetry you should select two faces in that tool. It is better if they are adjacent. But it is not strictly required. They both should be symmetrical to each other. Also I am working over quick-uv tool. It was done on 60% month ago and then freezed. Now I have decided to finish it, because it could be really useful to perform quick and easy model unwrapping. I think that today or tomorrow I will finish all that stuff and upload the new update. 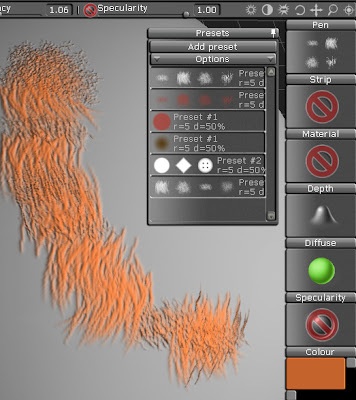 Also 3D-Brush will become multilingual. Now there is new menu item - Language. You can select 3 languales - english, russian or chinese. It is very easy to add new localisations. So if you want to see 3D-Brush on your native language, yo can help us in this question. Many bugs was fixed and feature requests was done. So, please wait for the new update - 2.02 is coming soon!